Fish is good for your health, that what I’ve been told. I really don’t care that fish is good for my health or not, I love eating them anyway. I grew up eating a lot of fish and seafood. I had a miserable two years of my life when I couldn’t eat shrimp. I didn’t know why I had allergic reaction to ship at that time. Maybe I ate too many of them, both cooked and raw and my body just had enough of it. I forced myself to eat it after a while, through all the throwing up and itchiness. I’m happy again that I don’t miss a good thing in life. Back to fish, you can do a lot of things with salmon: grill, broil, fried, steam, smoke, make curry or eat it raw. You can cook salmon with various ingredients within one method of cooking. So, how many ways you can cook a piece of salmon again? Countless! 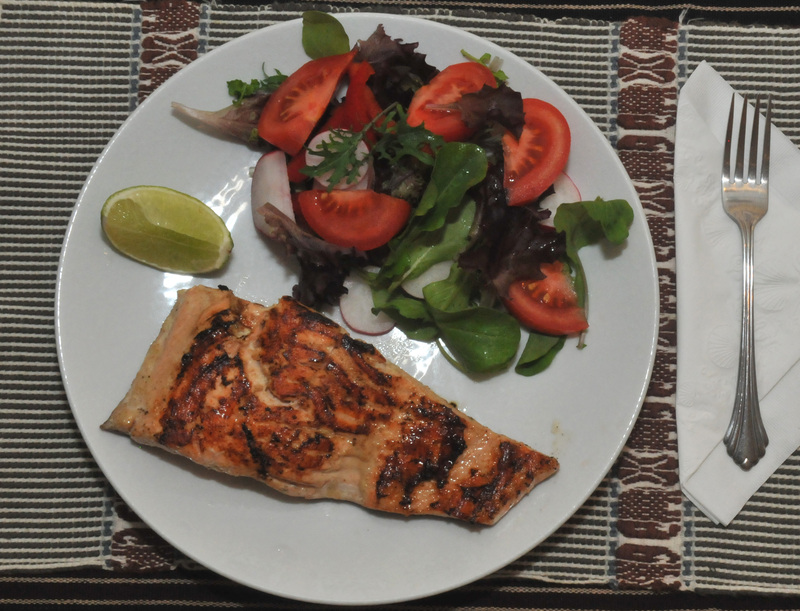 Last weekend we, or I in this matter, made seared Wasabe & mustard salmon with garden salad. It was easy to make and we felt healthy already. Mixed Wasabe & mustard. I used Stonewall Kitchen. No, I don’t have any stock in this company. They just make good condiments and spread. Mixed salad green that you like. We just picked what ever we had in the garden at the time. Last weekend our salad was a combination of arugula, French breakfast radish, Belle radish, Metzuma, Pak choi and a little cheat on supermarket tomato and bell pepper. Mixed the Wasabe & mustard with lemon or lime juice to your preference. My trick is whenever I use a new ingredient I would taste it by itself first. I’ll know exactly how much I should add the other ingredients because I know how salty, sweet, sour it is. Then I know how much to add the other stuff. Rub the mixture on the salmon. Put the rubbed salmon in the bowl and refrigerate it for a couple of hours. Wet the grilling pan with olive oil. Drop the salmon on the pan, skin side first. Turn it after 2 minutes. Take the salon out after a couple of minutes. We like the fish a little raw inside. For well-done fish you may have to cook longer. Just remember, fish will continue cook after you take it off the heat. I’d like a 7pm reservation with a view of the roses!! Of course, jasmines and booze included. Can you speak hummingbird?